Pound each breast to 2/5 inch thick. Sprinkle each side generously with salt and pepper. Place flour in shallow dish. Coat the chicken in flour, shaking off the excess flour. Add garlic to the skillet and stir for 20 seconds or until golden. Add chicken broth and bring to a simmer. Use a spatula to scrape the brown bits from the bottom of the pan into the liquid. Mix 1 teaspoon of reserved flour with 2 Tablespoons of water. Add honey, lemon juice, and flour/water mixture into the skillet. Mix and bring to a simmer for 2 to 3 minutes until thickened into a syrup. Add salt and pepper to taste. 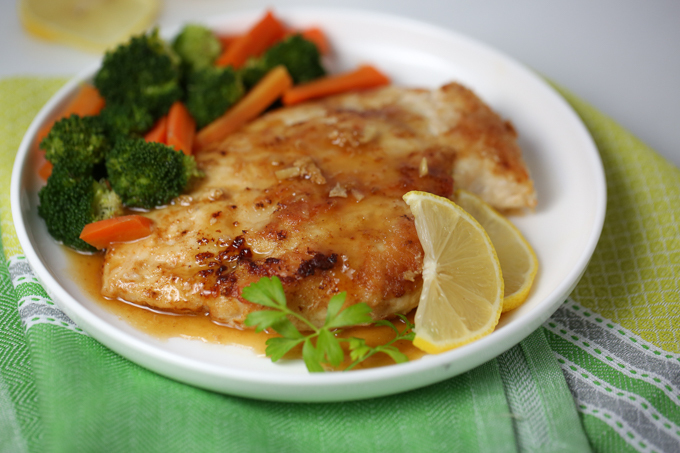 To serve, pour sauce over chicken and garnish with parsley and lemon slices. Tomorrow marks the first Saratoga Farmers’ Market of 2018. It also rings in the market’s 40th year. For many longtime vendors, the milestone marks a moment of pride. 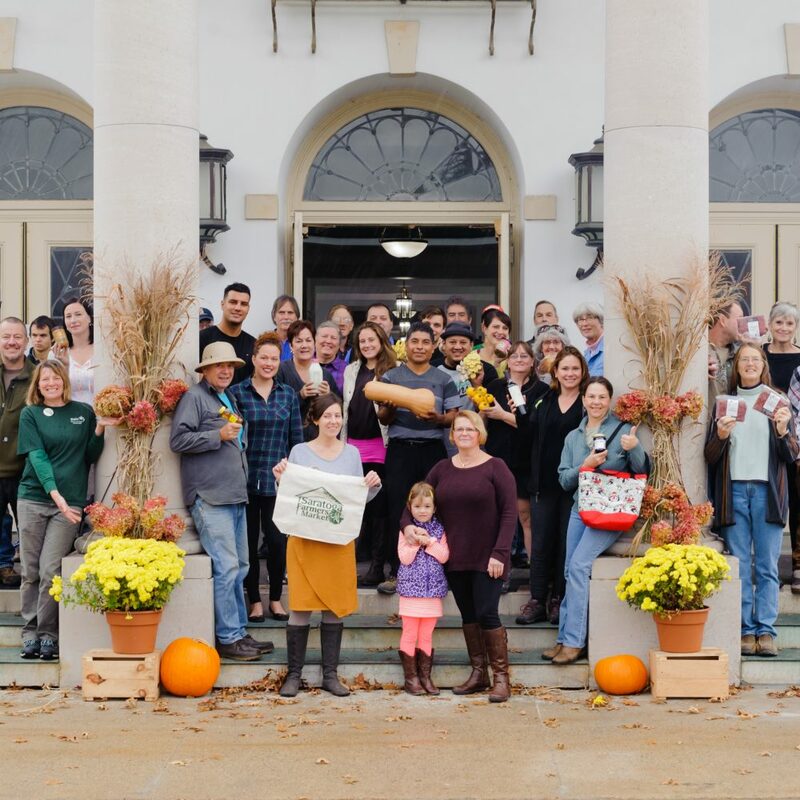 It affirms that the Saratoga Farmers’ Market mission of supporting Saratoga with fresh farm foods continues to thrive. 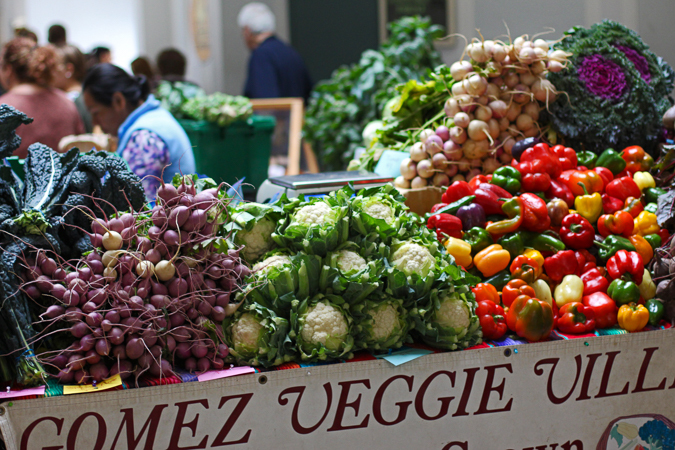 Farmers’ markets have deep roots in American society, dating back to Native American trading spaces. Markets all but disappeared after World War II, however, as a result of corporate agriculture and the arrival of national grocery store chains that taught consumers to prioritize convenience over freshness. By 1965, there were just six farmers’ markets in New York State. The decline began to reverse in the 1970s. In 1976, the U.S. Congress passed a Farmer to Consumer Direct Marketing Act. The act authorized the U.S. Department of Agriculture to provide public money to states to promote direct marketing between farmers and consumers in ways that would be clean, healthy, and safe for all. 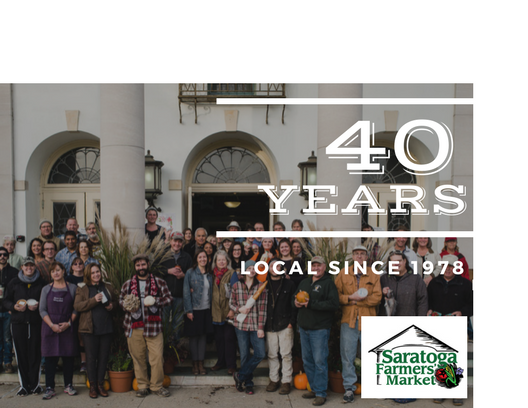 Two years later, the Saratoga Farmers’ Market was established, and area farmers began bringing plant seedlings and fresh produce to downtown Saratoga. 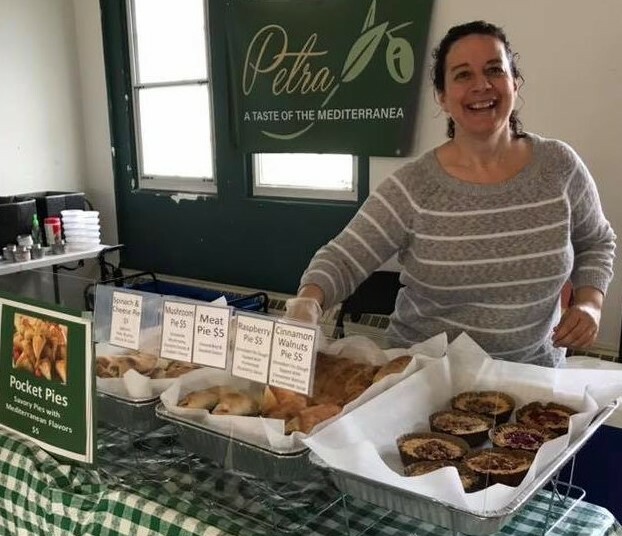 The first season was a challenge, as many longtime vendors recall, but persistence paid off and today farmers’ markets are becoming an increasingly important aspect of many communities and an important contributor to the economies of such small cities as Saratoga. 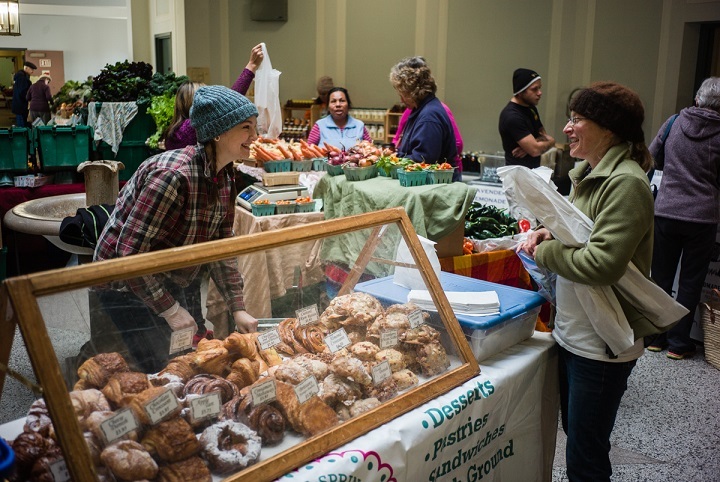 While the breadth of today’s Saratoga Farmers’ Market has changed considerably, its mission remains the same. Vendors sell fruits and vegetables, meat, eggs, fish, cheeses, maple syrup, honey, and an array of prepared goods. The overall market offerings also continue to be predominantly agricultural items grown or raised within four counties. Three-fourths of the items available at the market are agricultural. This new year brings some changes. Rick Green of Ballston Lake Apiaries has hung up his beekeeper hat to enjoy retirement, along with Albert Sheldon of Sheldon Farms. Joining the winter market are several specialty food vendors who made their debut in the holiday market last month. And the market board recently voted to approve products from Warren County into its mix, expanding the base from four counties – Saratoga, Washington, Schenectady, and Rensselaer – to five. Put the orange zest, cinnamon stick, thyme, bay leaf, peppercorns, cloves, celery leaves and parsley onto a layer of cheesecloth and tie it up in order to make a bouquet garni. Put it aside. Get a big, non-reactive dish and put celery, garlic, beef, onions, carrots, bouquet garni, and bacon into it, all at once. Pour the cognac and wine over the mixture. Put the mixture in refrigerator for marinating for about 24 hours. Preheat your oven accurately to 325 F. Get the beef out of vegetables, and put it on a kitchen towel for draining. Get a skillet and put oil into it. Heat the oil on medium heat. Put the beef into the pan along with some flour. Cook it until it turns brown. Remove the beef and deglaze the skillet with tomato paste and beef stock. Scrap all the browned bits of beef from the pan’s bottom. 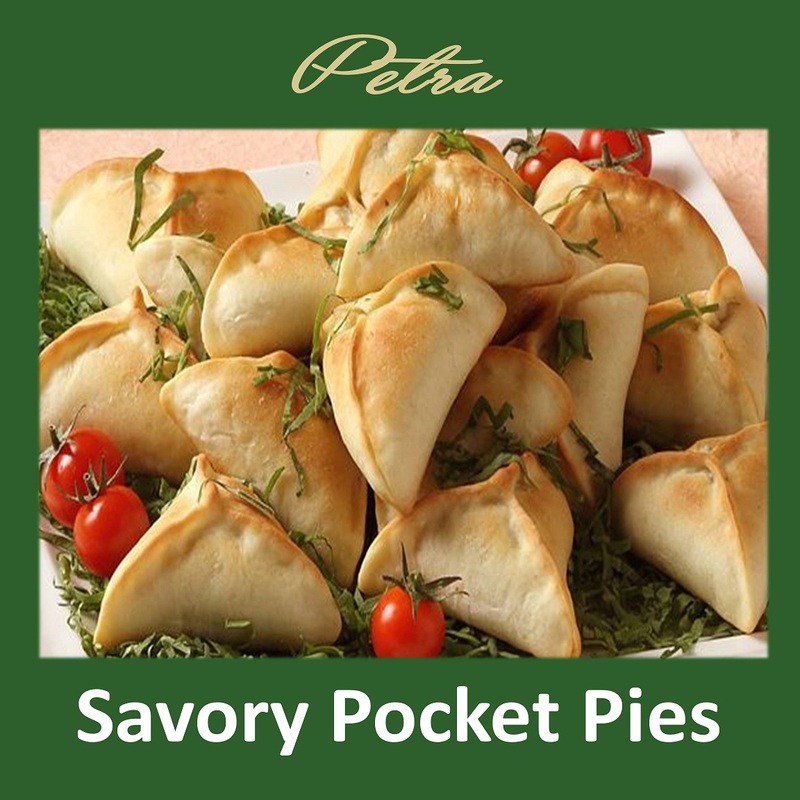 Mix the pan sauce, salt, olives, beef, and vegetables-wine mixture together in an ovenproof dish. Cover it. Next, you need to braise the beef for 2 to 3 hours, until it is tender. 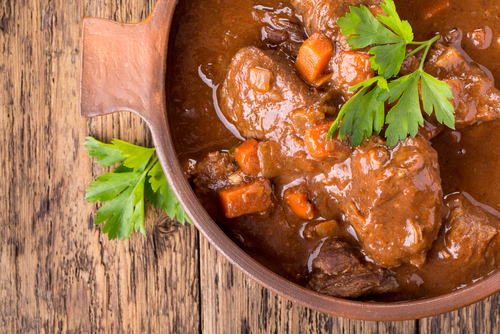 If you want your stew to be thicker, check after 2 hours of cooking and remove the lid for the rest of the time. Prepare the rice according to the direction given on package. Garnish your stew with cooked rice and parsley.